Corrective undertone continued to persist as the Indian Equities continued with its modest slide. The benchmark index NIFTY failed to sustain once again above 200-DMA after enjoying a modestly positive opening and finally ended the day with modest loss of 40.50 points or 0.40%. The session continued to remain volatile but also remained in a capped range. As we approach Friday, the analysis remains once again on similar lines. 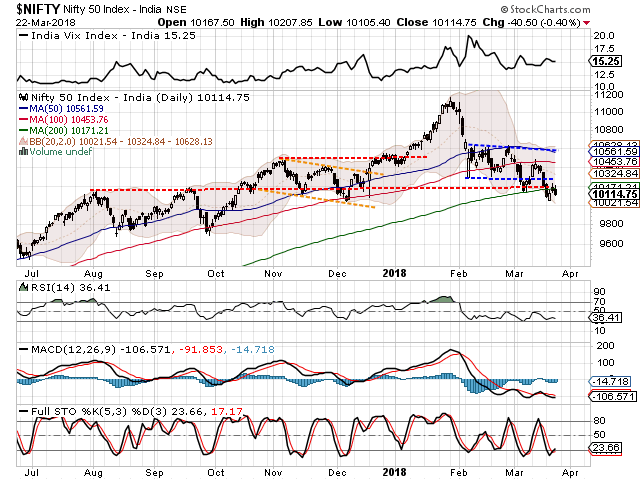 The NIFTY has resisted to the 200-DMA which stand at 10171 now and unless NIFTY moves past this level, this level will continue to pose a resistance to the Markets at Close levels. We are expected to see a quiet opening once again. However, the levels of 10170 and 10135 will continue to offer strong resistance area for the Markets. Supports continue to remain at 10040 and 9980. The Relative Strength Index – RSI on the Daily Chart is 36.4130 and this continues to remain neutral showing no divergence against the price. Daily MACD stays bearish while it trades below its signal line. No significant formations were observed on Candles. Having a look at pattern analysis, it is seen that the NIFTY dipped below the 200-DMA at Close and while attempting to pullback, this level has offered a stiff resistance. Any pullback will be seen only after the NIFTY moves past and closes above the 200-DMA. Having said this, the oscillators have begun to turn upwards for the Index on the Daily Charts while being still oversold on the Weekly Charts. 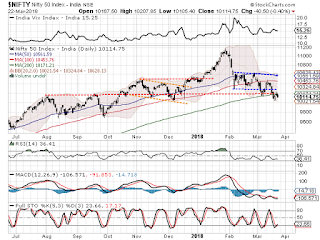 The level of 10040 will continue to offer a strong pattern support for the Markets. However, it would s till remain important to note that in spite of any strong opening that the Markets may see at opening of during the session, unless it ends itself above 200-DMA, it will continue to remain vulnerable to sell offs. We continue to recommend approaching markets on a very cautious note until it throws an imminent pullback taking it above 200-DMA at close. Good technical set up is observed on counters like BAJAJ FINSERV, CG POWER, VEDANTA, HINDZINC, INDUSIND BANK, IDFC, RELIANCE, TATA POWER, TATA MOTORS, HINDALCO and NTPC.